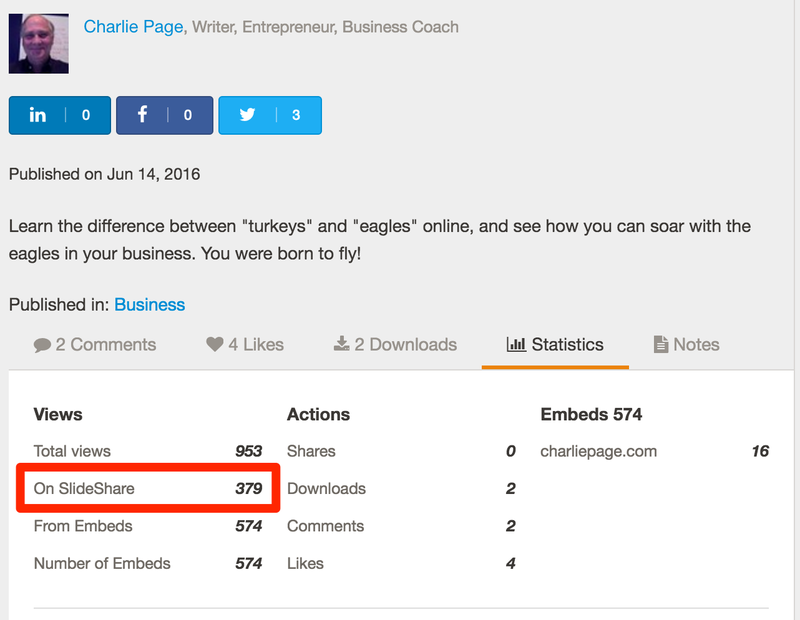 In my last article about getting free traffic from Slideshare, I mentioned that this was an experiment for me. I also offered to report back. This is Part 2 of a multi-part series of articles. In part 1 I shared my actual presentation. You can even embed it on your own blog or website! In part 3 I shared our surprising list building results. These links will open in a new window so you can come right back here. Many of you contacted me (via comments and otherwise) to say "yes, please DO share your results and process." Here is an update after one week. In this short update I will focus on the experience so far, the traffic received and my overall impressions. In the next article I will focus on the process I used, where I got the idea and how you can clone this idea to get more exposure for your site for free. Sound good? Then let's get to work! Slideshare shows you the number of views to your slideshow in a somewhat confusing way. I can't complain as their service is free. Here is an image showing my views in the last week. Looking at the top left number (just above the red box) you can see Slideshare is telling me that my TOTAL VIEWS were 953. 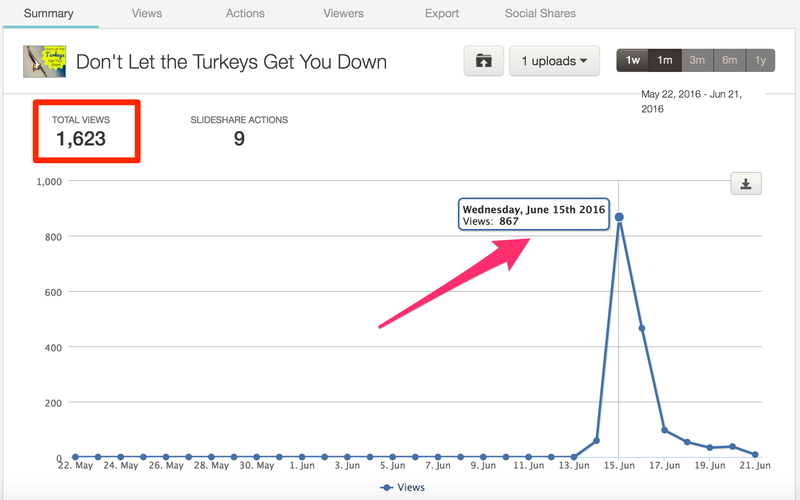 If you look at the red box you will see that 379 of those views came from Slideshare's site. And that is the magic number for me. What I want to know is this - does doing this create a situation where new people find me and learn about my site for the first time. My first conclusion is this - the process works! There are now 379 people who did not know about me before and now they do. And this cost me zero dollars. That is a win. I'll happily take that every week.? Assuming I am right and they are new to me, that would be 19,708 new people learning about me in one year. Here is something interesting, and worth knowing. If you look at their analytics report (also free) you will see that TOTAL views and UNIQUE views are reported differently. When I dig a little deeper I now see a different story. My total views were not 953 as I thought. When you factor in returning viewers they were in fact over 1600. That is quite a difference! Here is an image showing ALL views, not just the unique. In my opinion, they could do this a little better. Total views matter because that means that people are coming back to see the slideshow again. And any site owner knows that returning visitors are very valuable people indeed! ?I discovered another nice fact. 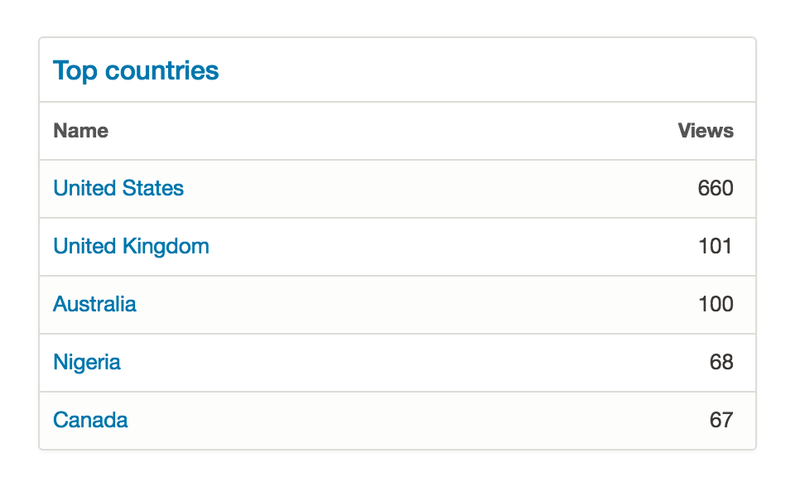 Most of the people seeing my Slideshare are from the countries where I do the most business. That means they are people who I might be able to help with free or paid products. I'll stop there for today. If this method interests you, please DO leave a comment below. I'm happy to share but it's nice knowing that people are being helped by your work. Here's what is coming in the next articles. ?How to find content for your slideshows almost instantly. How to create the slides using free online tools. How to save and output your slideshow for Slideshare. How to use keywords and tags to get noticed. How to build your list using this method. One final note - my total promotion on this was to post to my blog and send one message to blog readers on my list. I did not reach out to my marketing friends or send solo ads or buy any traffic on this specifically so I could report more pure results. Now that the first week is past, I will be doing some promotion. And I will report on that as well if you want to hear about it. So do let me know. Until then, be well and remember that little hinges swing big doors. I know that 300 new people learning about you does not sound like very much. But as I often tell consulting clients, it's what happens after they get to your site that matters. Hint - our list building was up and our traffic up almost 20% too. More about that in another "results" report. Thanks Charlie its very informative as usual.Sorrt I am late replying but my wife is unwell & I am head cook & bottle washer etc at the moment! Thank you for your kind words. I am sorry to hear about your wife. We will be praying for her recovery and for your strength to hold up as you take on new chores and challenges. As you know I am new to all this and at the moment my head is spinning. I appreciate the introduction to Slideshare and find it a very interesting tool. I am looking forward to your future articles as I try to get a grip on all of this. Thank Gerry. Look forward to connecting with you again soon. You are doing great, even though I know it can be confusing. Keep at it and you will get there! That is pretty cool. Do you have any stats on how many of those visitors are coming to your site afterwards? Or how they are finding your slideshare? I’m checking into that now. It’s a little challenging to get very specific since you can’t link to the first 4 slides and that is where my contact information ended up. Live and learn – will do it differently on the next one. Hi Charlie, long time no talk, my fault not yours, as a result of out talk back in in 2012 I now have two successful businesses, points from my experience, there are more than one slideshare type site, although this is the most powerful these other sites will also send traffic, then you can convert into an eBook and share on those sites too (Doc Stock is One) then you can covert into a PDF and upload to the PDF sharing sites, you already know about the article sites, then you can also convert this to a video for video sharing sites. All will send you traffic and Slideshare and Docstock will most probably send you most traffic, but you can really ramp this up. We used to use this system in our SEO Business and it really does ramp up a websites SEO too, all these links are from powerful domains that Google likes, so you by using this system will get additional traffic (a major SEO factor in itself) plus good trusted links, it’s a win win win situation and trust me it works very well for traffic and increased rankings. SEO Consultant, Video Marketer and Reputation Management Consultant. Great to hear from you. I’m so happy our call was helpful. Thank you for your insights. I will be following up on them as I progress with this form of marketing. the move from social media to another website. Thanks Mary! More to come.